Improved contrast. Faster perception. Higher performance. Improved Sunlight Readability. The traditional method of making an LCD viewable outdoors (in bright ambient light) is to increase the intensity of the backlight to approximately 750 to 1000 cd/m2 (nits). This attempts to make the viewable light greater than the reflected ambient light by shifting the display viewing to a higher luminance level. There are a number of problems with this approach if it’s the only action taken. Increasing the backlight brightness raises both the black luminance and the white luminance, which actually reduces the contrast ratio (all other things unchanged). Lower contrast makes the display harder to read. The real problem with LCD outdoor viewability is contrast, not brightness. Contrast is the ratio of the white level to the black level. Or, said another way, a display’s contrast ratio is the difference in light intensity between the brightest white pixel and the darkest black pixel. In this situation we’re talking about “extrinsic” contrast, meaning a reading taken from a distance that accounts for ambient light and reflections. (The contrast ratio in a display’s specifications sheet is “intrinsic” contrast, measured at the surface of the screen in a dark room.) Increasing the extrinsic contrast ratio improves the outdoor viewability. Some rule-of-thumb values for extrinsic contrast are shown in Table 1 below. The objective of outdoor-viewability enhancement is to increase somewhat the LCD’s luminance level as well as its contrast ratio by reducing the amount of ambient light reflected by the LCD and anything on top of it (such as a touch screen). Light is reflected from any surface in the optical path where there’s a change in the index of refraction. The greater the difference, the more light is reflected from the surface. Air has an index of refraction of 1.0, glass has an index of around 1.5 and plastic film has an index of around 1.6. This difference between 1.0 and 1.5 or 1.6 results in an average of 4.5% reflected light per surface (actually it varies from 4% to 5% depending on the difference in refractive index, the wavelength and other factors). 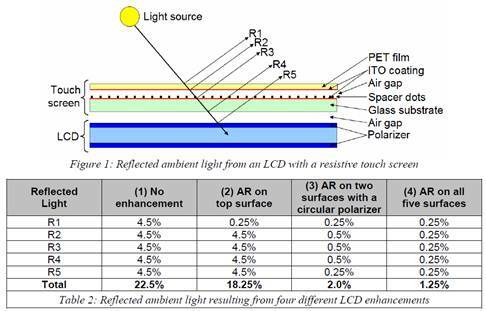 Figure 1 below diagrams the reflected light from an LCD with a standard resistive touch screen; Table 2 below shows four different enhancement cases. Increase TFT AMLCD readability-at-a glance capability by specifying an optically bonded TFT display from AbraxSys. Combine LED backlight enhancement, optical coatings, or touchscreens to meet your human interface requirements. AbraxSys' optical bonding facility provides proven quality systems, extensive in-house optical test verification capabilities, a certified clean room and other environmental controls. Standard LCD displays are fine for most indoor applications, but they are challenged in outdoor, rugged or environmentally extreme applications. For these applications, commercial displays are all but useless. The choices are either make the display washout less, or make the display brighter; and in some cases, both options. The OEM display manufacturers are not focused on these extreme markets and applications. This is where AbraxSys helps the display customer. AbraxSys' line of high performance optically bonded displays are ideal for outdoor or rugged environments where top performance is required. 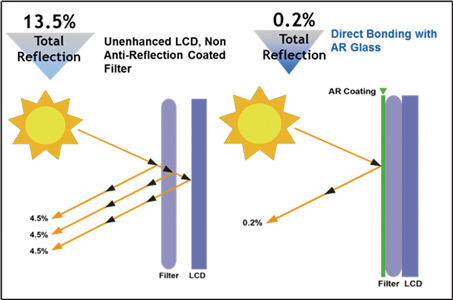 • Fast, responsive manufacturing in U.S.A.
AbraxSys optical bonding gives the competitive advantage of eliminating the air-gap between the glass surface and display. When comparing an optically bonded cover-plate with a traditional cover-plate, the benefits become very clear. Please see the below diagrams. Multiple tests have been conducted to show the increased benefits of optically bonded panels. Scratch resistance testing was conducted using AbraxSys' special adhesive. Tests proved that scratch resistance was increased by 300% over non-bonded display surfaces. 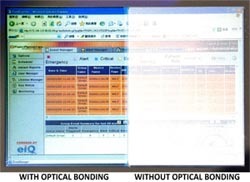 Contact an AbraxSys associate today to learn more about our LCD Optical Bonding capabilities.